⚠️ Please Note: This tutorial is only suggested as a starting place. You'll need to customize the code examples for your own specific needs. While we are not able to assist with custom coding, we hope this article helps you get started! By default, only the Event Title and Event Description are required on the Community Events submission form. But you can use plugin filters to modify what fields are required and/or what error messages display when a required field hasn't been filled out by the submitter. ☝️ These two shortcuts make the entire venue section or organizer section required, respectively. 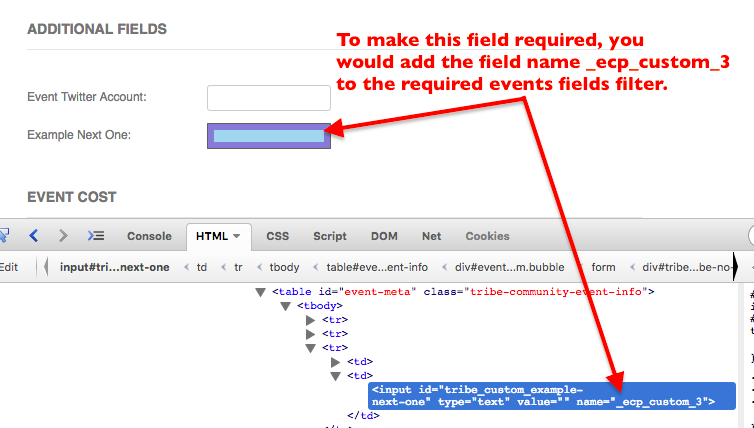 If either is added via the tribe_events_community_required_fields filter, then the user has to pick an existing venue or organizer option or create a new one—the venue or organizer can't be left. You can see a full list of the default fields below. Writing custom error messages is something rather specific to your project. It's also specific to the messages you want to display and to the fields whose lack of being filled out you want to act as triggers for messages. These are all of the default Community Events submission form fields, which can be used in the filters discussed above. Please note that these field names are case sensitive. 🔔Quick Tip: If you have Events Calendar Pro custom fields that display on the form, then you can even specify these fields as required. Just view the HTML source and find the correct <input> tag, and look for the "name" attribute (screenshot) to specify in your array of required fields. If you would like to further customize the Community Events submission forms, take a look at our Themer's Guide for more information on using template overrides to do so. You can also check out our Customizations overview page if you have any interest in hiring a professional developer to assist you with your project.